5.1. 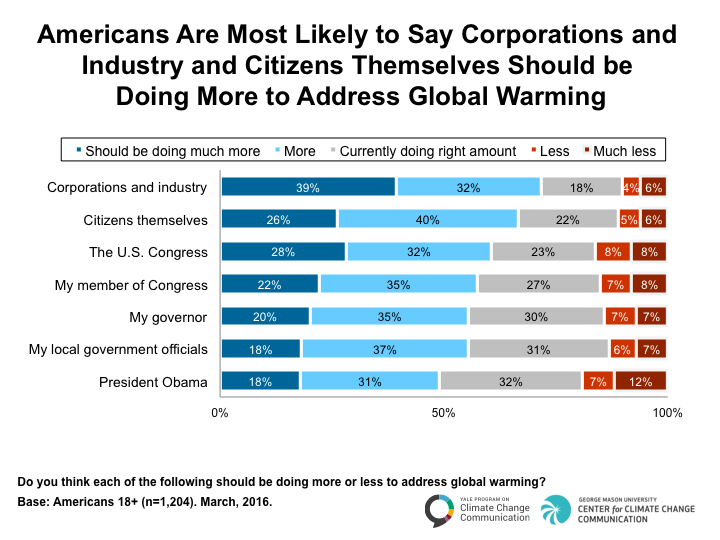 Americans are most likely to say corporations and industry, and citizens themselves, should be doing more to address global warming. Moreover, six in ten Americans (61%) say the U.S. should reduce its own greenhouse gas emissions, regardless of what other countries do (see Table, p. 41, for details). Relatively few (13%) say the U.S. should reduce its emissions only if other industrialized and/or developing countries do—and only 6% of Americans say the U.S. should not reduce its greenhouse gas emissions at all. 5.2. Americans say schools should teach children about the causes, consequences, and potential solutions to global warming. The Next Generation Science Standards The Next Generation Science Standards were developed by a collaboration of scientists and educators at the National Research Council of the National Academy of Sciences; the American Academy for the Advancement of Science; the National Teacher’s Association; 26 states; and Achieve (a non-profit organization). Released in 2013, the standards represent the most current, research-based method of educating K-12 students in STEM and preparing them for STEM careers. See: http://www.nextgenscience.org/ for K-12 STEM (Science, Technology, Engineering and Mathematics) education in the U.S. require that climate change be included in the curriculum, a mandate that is controversial in some parts of the country. Overall, however, Americans support the new standards: By a three-to-one margin, Americans support (76% “strongly” or “somewhat”) rather than oppose (23%) teaching our children about global warming in schools.